I first met animal rights philosopher Tom Regan in April of 1985 after he’d given a rousing speech in Philadelphia condemning the University of Pennsylvania’s baboon head-bashing experiments. 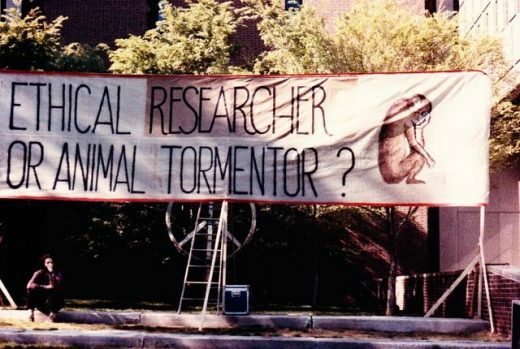 (This was the infamous Thomas Gennarelli lab which the Animal Liberation Front exposed by breaking in and taking tapes the researchers made of themselves.) Tom was walking across the commons area and I asked him to sign a copy of his book All That Dwell Therein: Essays on Animal Rights and Environmental Ethics. The pictures below are of that day. These were halcyon times for the animal movement. 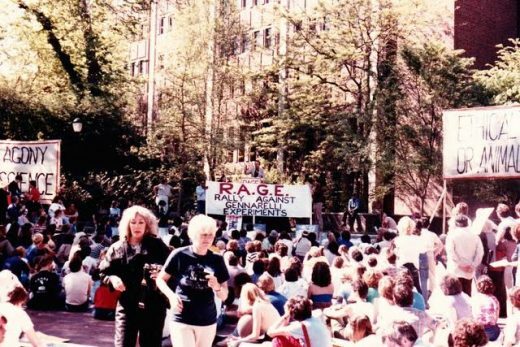 The annual FARM-organized Action for Life conferences were foundational in networking and training people who had no social change experience. 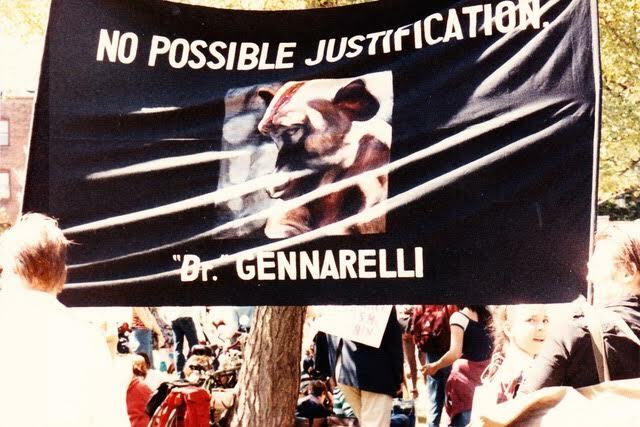 April 24, 1983 marked the official birth of the modern animal rights movement with four Mobilization for Animals rallies in Boston, Atlanta, Davis, California and Madison, Wisconsin. The many thousands who participated went back to our communities, organized grassroots groups and began putting slaughterhouses, research labs and factory farms in the faces of the American public. In England, the Animal Liberation Front waged war on fur farms, fur stores, factory farms, laboratories and meat shops. In popular culture, the television show LA Law showed graphic footage of animals caught in leghold traps to millions of viewers as part of one episode’s court case — and there were prominent anti-vivisection messages in three 1982 films: The Dark Crystal, The Secret of NIMH, and E.T. The Extra Terrestrial. We were vilified on most meat and pharma-supported news shows but homeboy (Dayton) Phil Donahue gave us a fair hearing. 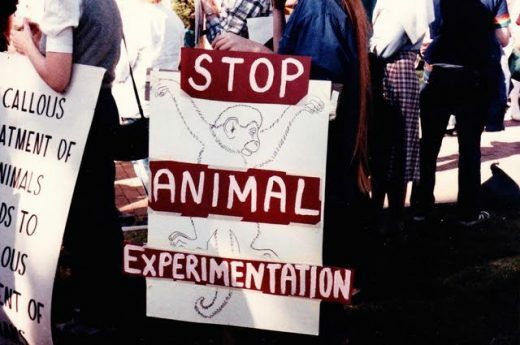 On the west coast the Javier Burgos-led SUPPRESS challenged the superstition of vivisection on scientific grounds and regularly fielded thousands of people to march against vivisection at UCLA and USC. Some hunters, vivisectors and animal farmers came in from the cold of killing and became eloquent spokespeople for the animals. Professional organizations like the Animal Legal Defense Fund, Psychologists for the Ethical Treatment of Animals and the Association of Veterinarians for Animal Rights were formed. PETA made animal cruelty the issue instead of sexist divisive tactics. Both Ingrid Newkirk and Marti Kheel — the latter the founder of Feminists for Animal Rights — were inspirations. Doing much to fan this whirlwind was a former butcher who became a philosopher and teacher, one who wasn’t satisfied with Peter Singer’s (Animal Liberation) utilitarian arguments for protecting non-humans — or humans, either, for that matter. Instead, North Carolina State Professor Tom Regan knew that to make a case for animal rights he first had make a case for human rights. Why should we be protected? What’s special about us? What are the relevant characteristics shared by, say, a rational adult human and a non-rational human infant? What makes humans human? What characteristics cross over to non-human animals? Like hundreds of other activists I brought Tom to my home town in Ohio to speak and give press interviews. He was indefatigable, upbeat, patient, wise. He saw the horrors of what humans do to other animals but he never let the horror make him bitter or cynical or divert him from his mission of combating it. He was dynamic and gregarious, a freely-drinking Irishman who was the life of any party whether it was in the Regan home or marching in the streets with a picket sign or even a historic sit-in with 100 other activists at the National Institutes of Health which resulted in funding being cut off to Gennarelli’s monkey-bashing experiments. It’s also impossible to talk about the greatness of Tom without also talking about the greatness of Nancy — the Culture and Animals Foundation was her idea. They were an incredible team and they showed how much can be accomplished by the power of love and the power of two people who love each other. Tom’s life was filled with interviews, debates, camaraderie, strategizing, conferences, protests and hundreds of lectures here and abroad, including China, Turkey, Italy and the Netherlands. He also excelled at the thankless task of mediating between squabbling individuals and groups within the animal movement. He felt that grassroots activists were as important as movement “leaders” because we were the only ones who could exercise a corrective effect on national groups which were businesses always in danger of getting too comfy with donor money and selling short the animals. Before Tom, there were only a handful of philosophy courses in America that mentioned animal rights — now over 100,000 students each year are discussing the issue. As he said: “It is no exaggeration to say that, during the past thirty years, philosophers have written vastly more on the topic of ethics and animals than our predecessors had written in the previous three thousand.” He wrote over twenty books, most of them concerning animals but also including fiction and scholarly works on the philosopher G.E. Moore. He won the highest teaching award at NC State and also gave what is considered the greatest animal rights speech ever in Los Angeles in 1988. Countless times over the years I would discover that some publication or some pro-animal production was funded by the Culture and Animals Foundation or I would meet someone who wrote something that Tom had edited and critiqued. Or someone who would first discover, say, the work of artist Sue Coe or performance artist Rachel Rosenthal because Tom brought these great people to Raleigh to display their talent. 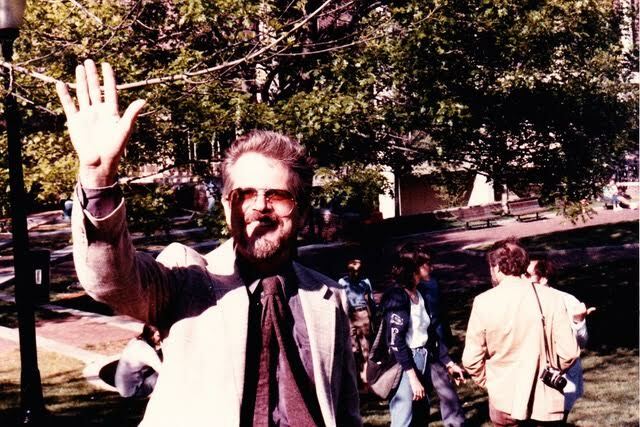 One of the greatest things that Tom did was to establish the Tom Regan Animal Rights Archive at North Carolina State which contain not only his work but entire collections of other groups and individuals. 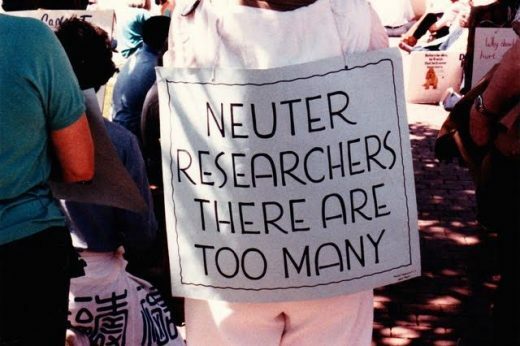 One such collection is Argus Archives, established in 1969 by the pioneering psychiatrist turned animal activist Dallas Pratt, who disseminated information in the 1960s about the plight of animals in slaughterhouses and research labs. The Regan archives also contain the indispensable work of photo-journalist Ron Scott who seemed to be at every protest and conference documenting the early years of the animal rights movement. Six years ago, traveling back to Philadelphia from Florida, I got it in my head to call up the Regans even though we hadn’t spoken in many years. They said come on over. I was with my friend Lisa Levinson (of toad detour fame) and we spent several hours visiting. The fact that we were there was utterly Reganesque: Lisa attended one of Tom’s gatherings in Raleigh many years before where she met fellow Philadelphians Jim Harris and Zipora Schultz. They didn’t know each other even though they lived in the same city at the time. They had to make the pilgrimage to Raleigh to find one another — and the three went on to found the cultural animal advocacy group Public Eye: Artists for Animals. That’s what Tom and Nancy did: they were movement builders and change agents, they made it possible for more people to help more animals. They made people stronger. They enriched thousands of lives. We talked about everything. I asked if he thought there had ever been a credible intellectual challenge to The Case for Animal Rights and he said no but that he felt that the thorniest issue was what to do, if anything, with invasive species. Tom decided that my “mission” was to “call back” all the great activists of the old days who had dropped out of the movement. I didn’t want to be too negative — because Tom is one third of my Holy Trinity, along with Karl Marx and Dr. John McDougall — but I said that, in my own case, I felt like I didn’t know how to be effective any more, that the things we were doing were not working and that the really big gains could only be made once capitalism is overthrown. The animal movement couldn’t keep up with the depredations of global capitalism. Animal liberation can’t precede socialism. (Before we get to Tom’s world, we have to pass through Karl’s world.) Tom disagreed. He felt if enough consciousness was raised and laws were changed, animal rights could happen under any system. As the conversation wandered up to midnight we talked about those parties at the Regan’s house twenty five years earlier. During the annual festival for the animals, out of town activists would sometimes bunk at the Regan’s (or their equally gracious next door neighbors) and find ourselves in the kitchen cutting up vegetables for the large nightly meals. Tom asked me if I remembered the words of some intolerant judgmental activist back then who excoriated another person who still drank cow’s milk. I racked my brain trying to think who this was — Gary Francione, Carol Michael-Wade, Shelly Shapiro… who? I gave up and asked “So, who said that?” And Tom and Nancy roared in unison: “You did!” “I said that?” Oh, right, right… The Regans were charming, gracious, supportive, always concerned, always interested. Two of the most sterling humans I’ve ever known. This article was posted on Monday, February 27th, 2017 at 3:31pm and is filed under Interview, Life/Animal Rights.